Please be sure to carefully read the following instructions in full before you start assembling the product. This will help prevent any errors or damage during the assembly and hopefully speed it up so you can enjoy it sooner! If you do not have any experience with assembly or construction work, then Summerhouse24 would strongly recommend that you consult a professional carpenter, builder or DIY expert locally to you or use the professional Summerhouse24 assembly team. PLEASE NOTE: Please consult the packing slip to ensure that you have received a complete and undamaged product. The packing slip will provide you with the quantity and measurements of all the components. Please do not discard the packing slip until the warranty has expired. 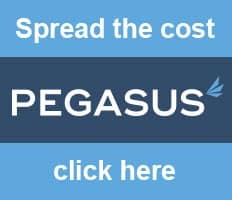 This packing slip allows you to check that you have all the components at any time, it provides proof of purchase, and enables you to identify the relevant component in the event a claim or warranty issue arises. You will find the exact measurements in the “wall planners” of these assembly instructions as well as in your documents and in the wall packing slip. All measurements in the assembly instructions are specified in millimeters (mm). We reserve the right to implement technological developments, which may result in slight deviations in the pictures. You must file a claim about any damaged or defective parts before assembling the product or the warranty will be void. 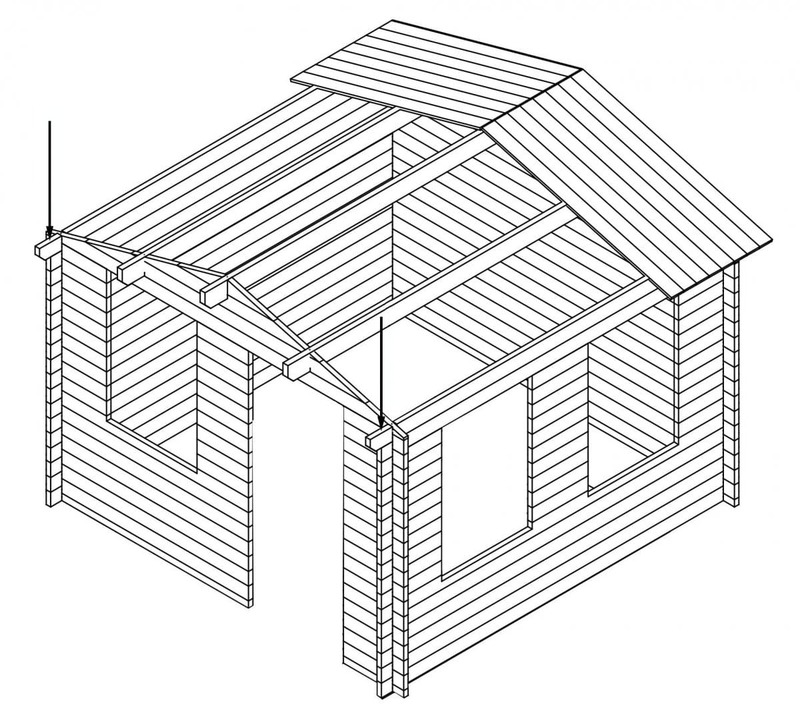 Your Summerhouse24 product is constructed from a “purely natural “product – wood. This means the structure is “alive“ so to speak, meaning that some shifting of the planks or small cracks in the wood may appear and can never be entirely excluded or avoided. The varying grain is typical for Nordic spruces. The occasional rough edge and plane marks on the back of roof boards or floor boards, respectively, are due to production processes and do not represent quality and production-related defects. Our woods come from environmentally friendly forests and have not been chemically treated (except for impregnated foundation planks), which is why the wood may turn gray over time. This may be avoided by painting the wood surface with varnish or another finishing coat. The wall planks do not have to be painted before assembling the house and it is best to do so once the assembly has been completed and in dry weather. If you wish to paint the individual components with different colors, you should do so before assembling the house. It is also recommended to impregnate the underside of the floor planks as well as the roof planks before starting the assembly. We also recommend you to treat the doors as well as the door and window frames from the inside. Please note that good ventilation and the prevention of moisture accumulation are the best protection against your garden building developing any rot. Beware! Protect the wood before and after assembly against prolonged sun or moisture exposure as this may lead to the boards becoming warped. Once assembly has been completed, the house should be treated with a protective wood finish as quickly as possible. You will need the following tools: handsaw, screw driver, rubber mallet, hammer, level, tape measure, drill, knife, a pair of pliers, and a ladder. Please do not be confused by the number of wood components. If you presort them using the plans and inventory list that are included, the assembly is conceivably simple! Before you start assembling the product, please check the content of the box and compare it to the inventory list. The sketch will provide you with an overview of the entire assembly. Houses with walls thicker than 44 mm will require you to install threaded rods in the pre-drilled holes on the front of the house for storm protection. Only one end of the plank has predrilled holes and these must always be positioned towards the front side of the house. This is so you can insert the rod through all the holes when the wall has been built up. Just one wrongly orientated plank will mean you are unable to insert the storm rods. Except for the pre-drilled holes, the ends of the planks are identical, so that is why you have to pay attention to where the holes are! Ends with holes must always go to the front side of the cabin. 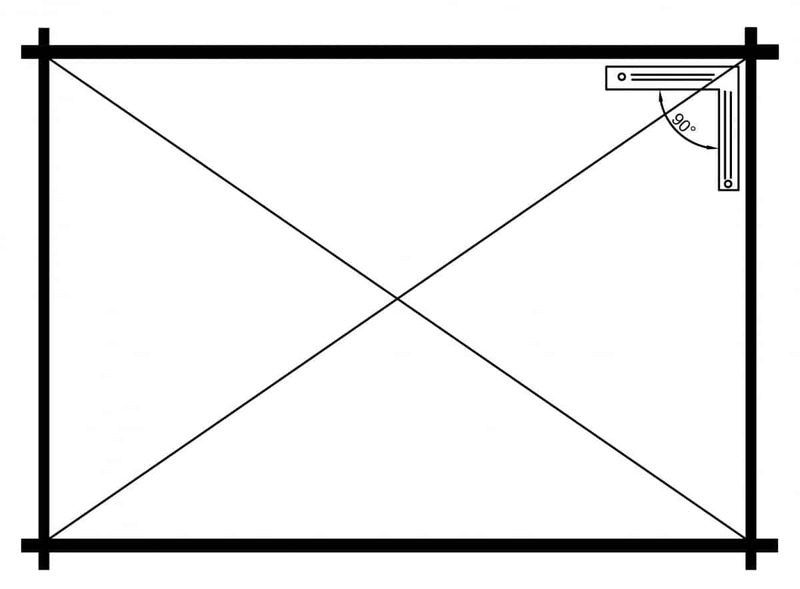 See diagram on next page. It is vital that you pay attention to the numbers of the individual components during the presorting and assembly process. Place the impregnated foundation planks, evenly spaced, on top of the foundation according to the sketches that are included. The moisture barrier (i.e. roofing felt or similar) that is placed between the foundation and the foundation planks will protect your garden house from moisture and rotting. The arrangement of the foundation planks will provide you with the exact measurement for mounting the wall elements. The foundation planks may vary depending on the different models. Please follow the enclosed foundation plan. Once you put together the entire structure horizontally and at a strict right angle, attach the first layer of planks where the foundation wood connects using long nails or screws. You MUST drill pilot holes first. After attaching the sixth plank, measure the diagonal planks to ensure that they are at a right angle and that they have the same length. If necessary, please use a rubber mallet during the entire assembly process to manipulate components gently in to position. At all times, do not hit any grooves or cutaways as they are weaker until connected to the next component and this will help avoid damage. Please use the enclosed tapping block. 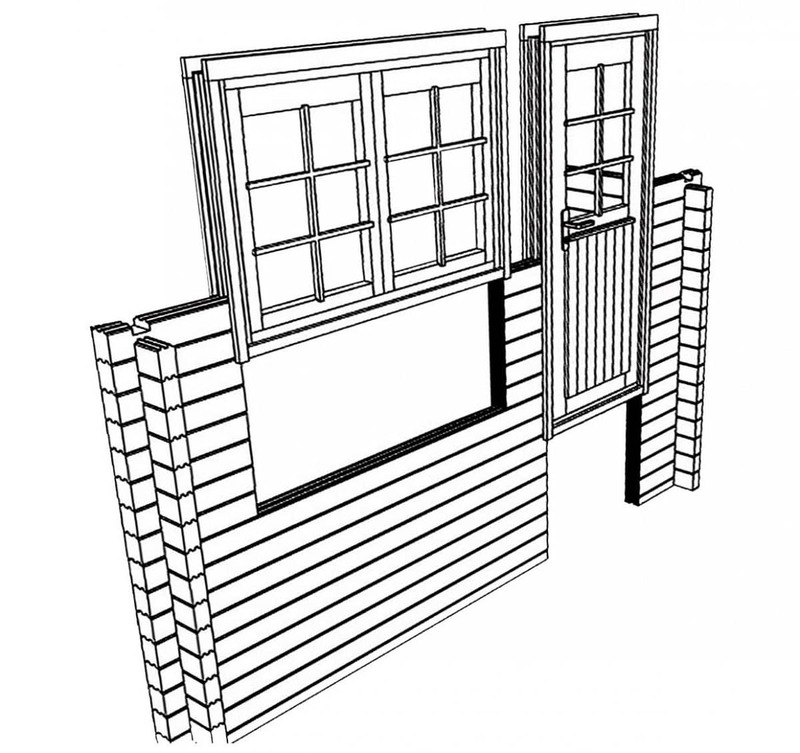 Build the walls according to the assembly instructions, one plank layer higher each time and insert the window at the height indicated in the instructions. In some models, the interior window frame is included in separate parts. Please assemble the four frame parts with screws (3.5×45). The window will be inserted at a later time. Summerhouse24 offers different window types. Please refer to the detailed window information sheet. Now it is time to insert the door. Together with the frame, it is inserted into the pre-planned opening from above. In some models, the interior door frame is included in separate parts. Please assemble the four frame parts with screws (3.5×45). The door will be inserted later. Please refer to the detailed information sheet as well. The wood will settle a few weeks after assembly has been completed. Now the doors and windows should be adjusted to eliminate any rubbing or sticking. Once all wall planks have been assembled, it is time to install the gable elements followed by the ridge purlins that are installed in between. Different models will feature additional right and left rafters. If your house features a double door, it is now time to hook the door in now and adjust it so that is moves freely. For this purpose, please ensure again that the house is horizontal and add spacers underneath the foundation planks, if necessary. It is best to also check the exact horizontal position of the house before installing the roof. When installing the roof, please be sure that the profile of the roof board is on the inside. Start with the two roof boards on the front of the house whereby the groove should point toward the outside. Afterwards, install the next roof boards evenly. During the entire roof assembly process, please be sure that the edges of the eaves are entirely parallel, that they hang over evenly and that they are mounted evenly on the ridge purlin. 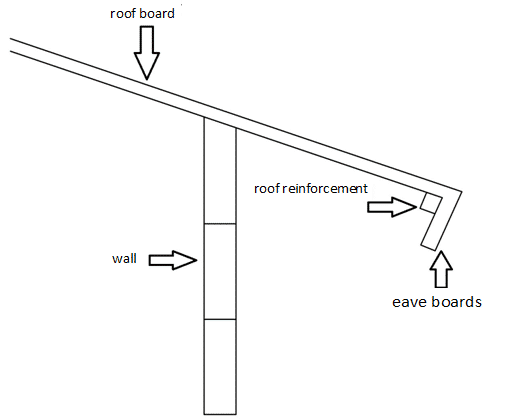 You can check this with a string or by comparing them to the lateral eaves. All roof panels must be mounted to the walls, the gable, and the ridge purlin with nails, using two nails per board into the wall plank or ridge purlin on an angle. Mount the roof boards to the gable triangle with two additional screws. The last roof board will have to be adjusted according to the overhang. It is now time to mount the eave boards making sure that they coincide with the upper edges of the roof. Screw the eave reinforcement to the eaves. Finally, lay roofing felt and/or shingles on top of the roof. Please make sure that the roofing felt hangs over the edges of the eaves by approximately 2 cm in order to guarantee protection from rain. Afterwards, mount the gable boards and cover strips to the roof and screw them to the roof ridge, the wall plank, and the eave board. We recommend you pre-drill the holes in the boards. Once you have built up the walls, but before you place the top wall planks of the side walls it is time to install roof joists accordingly to cabin plans. Then finally the top wall planks. Now place the roof boards. Roof boards are 7-10 cm shorter than the top wall planks of the side wall. 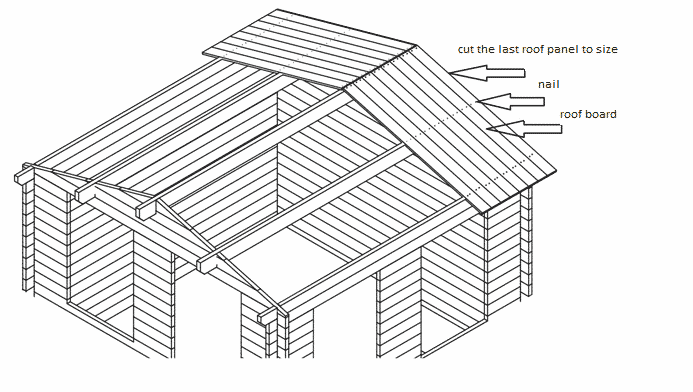 Place the roof boards evenly with the ends of side wall planks in front of the cabin (higher end of the roof) and it will result in a 7-10 cm distance between the ends of wall planks in the back side of the cabin (lower end of the roof) and the parapet that you will install later. This 7-10 cm distance between the end of the roof and parapet is required for letting the rain water run down freely and thus keeping the back side of the cabin dry and moisture free. Place the first roof board evenly with the ends of the roof joists on the side of the cabin. You can start from the left of the cabin, working towards to the right side or vice versa, whichever is more convenient for you. The last roof board to be installed will have to be adjusted according to the overhang. Parapets have veritcal strengthening strips on the back side. Before installing front wall parapet you must cut sockets into roof boards for strips to go in. This will allow you to install the parapet tightly to the roof. Parapets must be screwed to the ends of roof joists on the side walls and to the ends of the top wall planks in the front and back side of the cabin. Front and backside parapets must be additionally fixed and screwed to walls by using parapet supports. This is what makes parapets sturdy and stable. Parapets for larger cabins may consist of 2 or 3 pieces. Use parapet connecting strips to screw them together. Install front wall parapets first, then sides and the the back wall. Height of the parapet location is not fixed exactly. Our general advice is to lift the front wall parapet 5cm over the top wall planks, that is enough to install roofing felt later and place the parapet U-profiles on top of the parapet. Now when you have installed parapets it is time to place down the roofing felt. Start from the lower part of the roof. Lay the first row with 2-3 cm overhanging the back side of the roof to protect roofing boards from moisture. Roofing felt must also cover inner sides of side wall parapets and leave 1cm extra to cut them later when you have installed the entire roofing felt. Each next row must overlap previous row by minimum 10 cm to avoid moisture getting under the felt. When roofing felt has been laid, install U-profiles on the parapets. 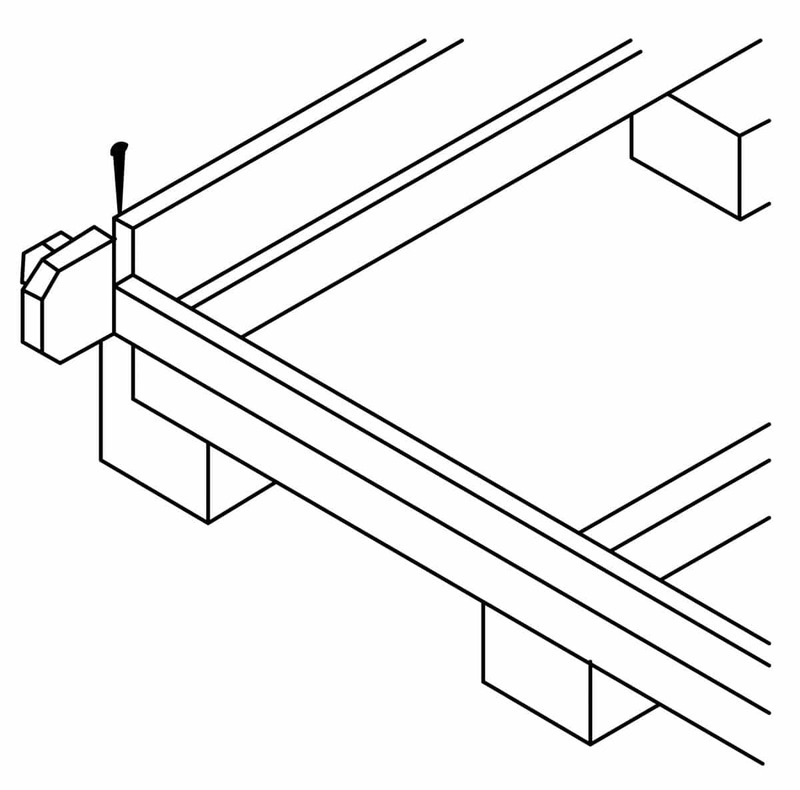 U-profiles must be cut into length and ends to 45 degrees for 4 cornes of the cabin. Many of Summerhouse24/Hansagarten24 cabins with large canopies have supporting post (s). 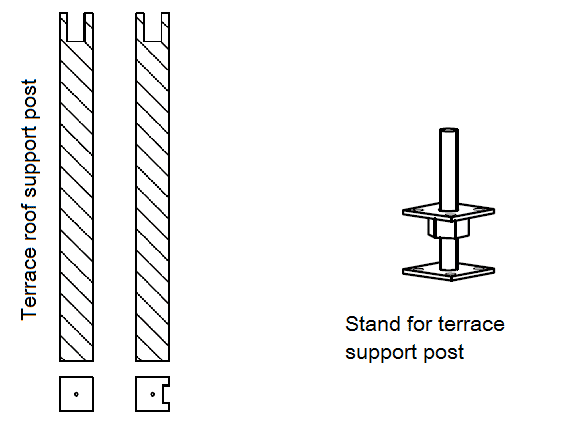 Supporting posts must be cut into length and installed accordingly to your cabin’s plans. Cut the post to leave ca 5cm distance to foundations planks. Insert metal stands into predrilled holes. Stands must be screwed to foundation planks. These metal stands allow you to adjust the height of the supporting posts. Then finally install terrace boards. Terrace boards must be installed by leaving 5mm distance between the boards. We hope that you were able to assemble the house without any problems and that you are happy with the result. The floor is laid down last in order to avoid damage to the floor boards. It is recommended to first impregnate the floor boards from beneath with a suitable wood preserver. Start at the edge of the front wall. The groove must point toward the door. Hammer two nails into each floor board and foundation wood at an angle. You may adjust the last floor board with a saw if necessary. Now adjust and mount the baseboards. Please note that because the floor boards are very dry, they easily absorb moisture which is why the boards should not be installed too closely together. This will keep the floor boards from warping. Now it is time to mount the baseboards with nails at a distance of between 40 and 50 cm. Now, attach two storm flaps to the front and the back, keeping them approximately 5 cm beneath the roof boards and 5 cm from the exterior wall. Press the lower part of the storm flap against the baseboards. Mark the upper and the lower hole and drill holes through the gable plank with either a wood or metal drill using a 6 mm or 8 mm drill bit. Mount the flap with the enclosed lock screws. Screw them in by hand only because the house may suffer damage if they are screwed in too tight. Houses with walls thicker than 44 mm will require you to install threaded rods in the pre-drilled holes on the front and the back of the house for storm protection.